The Merlin is one of the most popular paper aeroplanes on this site. It is a good looking design that can fly steadily, for long distances, whilst maintaining a fairly fast pace. It was designed as a replacement for The Lion paper aeroplane, and can fly better in most respects. However, The Merlin is not a good paper aeroplane for outdoor flying. The outer parts of its wings are somewhat flimsy, meaning it does not cope well with breezes from the side. It also can become unstable if thrown very hard. 1. Take one A4 piece of paper. 2. Fold the piece of paper exactly in half longways, then unfold. You should end up with something that looks like the picture on the right. In later stages, you will use the crease you have created as a guide fold, to help you get all your other folds straight. 3. 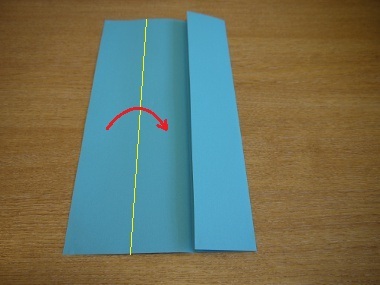 Now fold one edge of the paper in wards, as shown in the picture on the left. 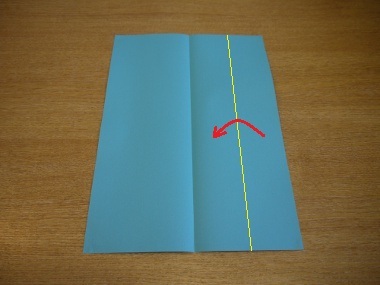 Make sure the long edge of the flap of paper you are folding meets exactly with the centre line you created in Step 2. You should end up with something that looks like the picture on the right. 5. 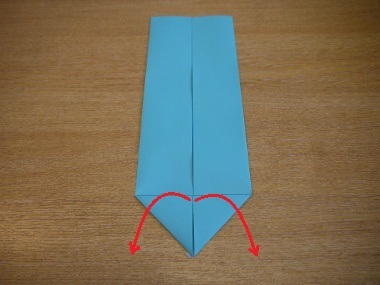 Fold the corners of one end of the plane so they meet the centre line. 6. Now undo the folds you made in step 5. 7. The next fold is a little bit tricky. You're going to push one of the corner folds inside itself. Follow the pictures A to E through to see what I mean. 8. Now do the same thing on the other side of the paper. You should end up with something that looks like this. 9. 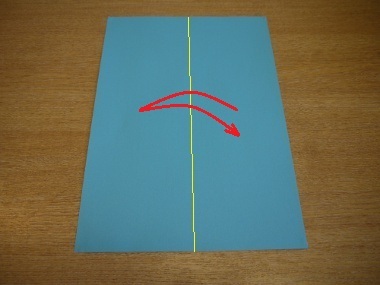 Now fold the top layer of paper, on one side of the plane, along the yellow line as shown in the picture on the left. Pay attention to exactly where the yellow line starts and ends. You should get something that looks like the picture on the right. 10. Do the exact same thing on the other side. 12. Now to the exact same thing on the other side. You should end up with something that looks like this. 13. Flip the paper aeroplane on to its back. 14. Fold inwards along the yellow lines as shown. 15. Flip the plane back over. It should look like this. 16. Fold along the yellow line as shown in the first picture. (A) shows the fold as it is being made; (B) shows the fold after completion. 17. Now fold the top flap of paper backwards according to the dimensions shown in the first picture. Pictures A to C show the fold being made. 18. 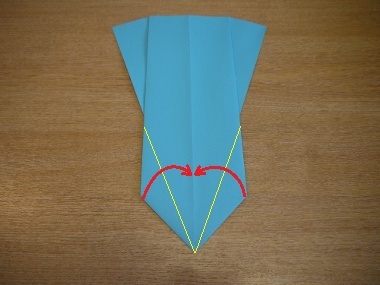 Now tuck the front of the top flap of paper under the two triangular flaps of paper below it as shown in the diagram on the left. You should end up with something that looks like the diagram on the right. 19. 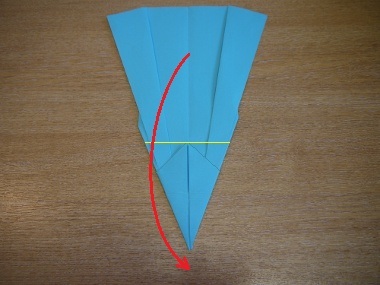 Fold the paper aeroplane inwards in half, along the centre line. You should end up with something that looks like the diagram on the right. 20. Now it's time to fold down one of the wings. If possible, use the dimensions shown in the picture on the left. 21. 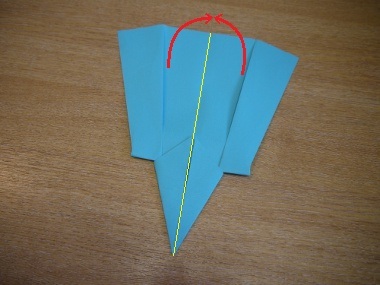 Now fold the other wing down, so you have something that looks like this. 22. 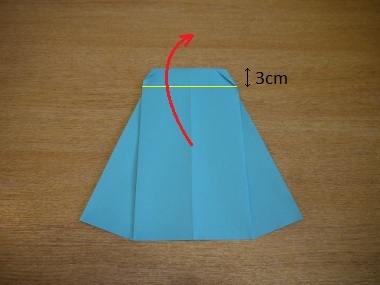 Flip the plane on to its back and fold the fins according to the dimensions shown. 23. Flip the paper aeroplane over again, and you're done. Dance yourself a merry jig! However, don't dwell on your groovy moves for too long: almost all paper aeroplanes need calibrating before they fly properly, so click here now to learn what to do! Remember, almost all paper aeroplanes need to be calibrated before they can fly properly - so visit the calibrating page now.